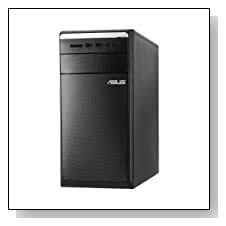 Asus M11BB-B10 Essentio is a modern desktop PC with the AMD 8 series quad core AMD A8-5500 processor at 3.2GHz speed up to 3.7GHz with turbo boost with 4MB L2 cache for efficient system processing, reliable and fast performance, also assisted by the large 8GB DDR3L SDRAM that offers superior multitasking power and that is also upgradeable up to 32GB, 1TB SATA III HDD as very spacious storage at 7200rpm rotating speed (faster read and write times than the standard 5400rpm) and Windows 8.1 that you can upgrade to Windows 10 free of charge until 29 July 2016 and we recommend you do as it is easier to use, is more stable and boots up faster. Mid 2012 release AMD A8-5500 processor has a thermal design power of 65 watts and includes heatsink and fan as cooling. Black Asus M11B-B10 Essentio weighs 17.4 pounds and measures 15.7 x 6.8 x 14.1 inches, has a current design and looks good. It doesn’t come with a monitor, keyboard or mouse by looking at the specs and photos but we may be wrong. 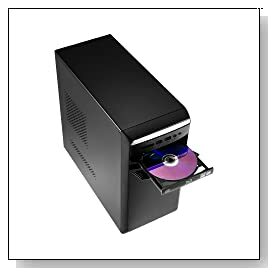 It has a Multiformat DVDRW/CD-RW Optical drive that lets you create custom CDs and DVDs, high speed 802.11ac wireless LAN for better internet connection and more coverage, Bluetooth 4.0 to connect to Bluetooth enabled devices like mobile phone, printer or speakers wirelessly, 10/100/1000 Ethernet LAN With RJ-45 connector, an HDMI port so you can connect to your HDTV or another HD screen via a good quality HDMI cable, 2 x USB 3.0 ports for up to ten times quicker data transfers of your digital sound, video and data, 6 x USB 2.0 ports to hook up many peripherals simultaneously and 6-in-1 Media Card Reader that supports SSD, SDHS, MS, MS Pro, MMC and xD-Picture Card formats. Graphics card is the AMD Radeon HD 7560D with shared video memory with video benchmark score of 666 as of today and performs better than the Intel HD 4000 and Radeon HD 7660G so you can experience good quality images with fine details- acceptable multimedia performance and can play some of the later more advanced games at low settings only and you will be more comfortable with the older titles at higher settings and acceptable frame rates. AMD A8-5500 processor, with a Passmark benchmark score of roughly 4000, is a high mid range processor that will handle all the daily tasks and more demanding software mostly without problems, 8GB is a lot of memory for most users and if you need more you can upgrade it up to 32GB and storage is 1 TB mechanical drive for capacity- size rather than speed but it is 7200rpm rather than 5400rpm that is mostly found on budget computers and you can always add an SSD as they are coming down in price. Although we don’t have the Essentio desktop in front of us and there aren’t many reviews online yet, judging by the specs and features you seem to be getting quite a bit for your dollar.